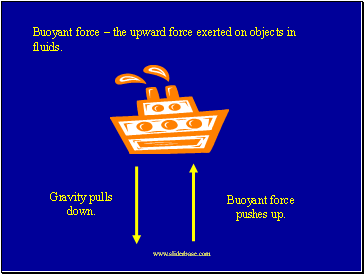 Buoyant force – the upward force exerted on objects in fluids. 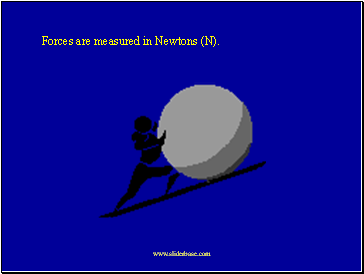 Forces are measured in Newtons (N). 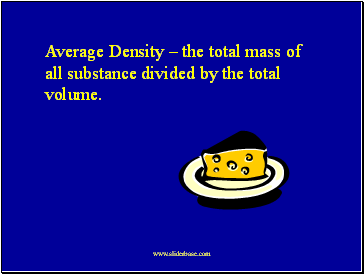 Average Density – the total mass of all substance divided by the total volume. 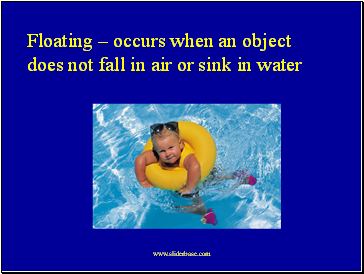 Objects float in water if they have an average density that is less than that of water. The density of water is 1.00 g/mL. 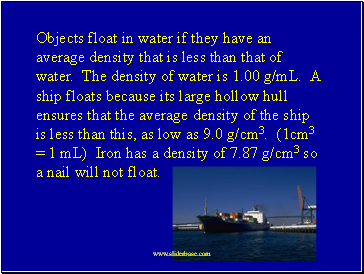 A ship floats because its large hollow hull ensures that the average density of the ship is less than this, as low as 9.0 g/cm3. 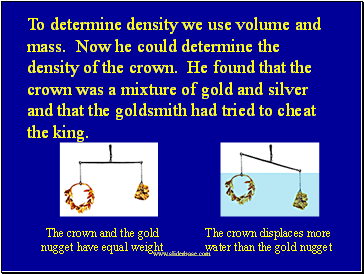 (1cm3 = 1 mL) Iron has a density of 7.87 g/cm3 so a nail will not float. 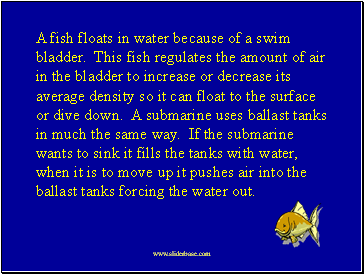 A fish floats in water because of a swim bladder. This fish regulates the amount of air in the bladder to increase or decrease its average density so it can float to the surface or dive down. A submarine uses ballast tanks in much the same way. If the submarine wants to sink it fills the tanks with water, when it is to move up it pushes air into the ballast tanks forcing the water out. 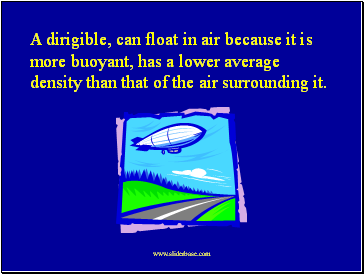 A dirigible, can float in air because it is more buoyant, has a lower average density than that of the air surrounding it. 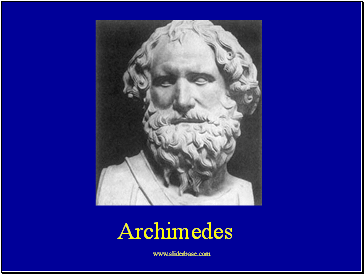 Archimedes was a famous mathematician and scientist that lived 212 BC. He was given a problem by his king, Hiero II, the ruler of Syracuse (Greece). 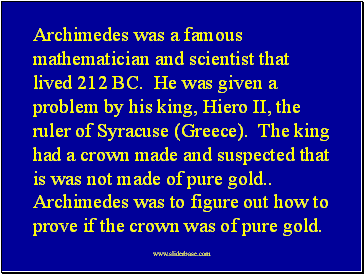 The king had a crown made and suspected that is was not made of pure gold Archimedes was to figure out how to prove if the crown was of pure gold. He didn’t know how to do this until getting into his bathtub. 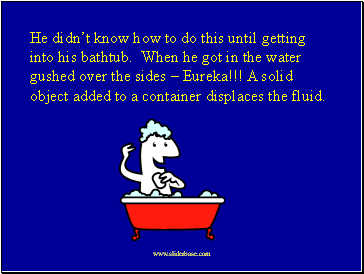 When he got in the water gushed over the sides – Eureka!!! 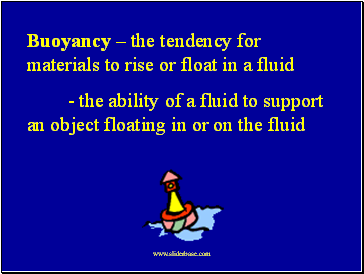 A solid object added to a container displaces the fluid.